Every child who has ever crept up behind someone and shouted “roar!” will enjoy this utterly adorable story with a gentle final twist. Everyone knows that tigers are sleek, silent, and totally terrifying . . . most tigers, that is. But no one is afraid of Little Tiger. He’s just too small and clumsy to frighten anyone. 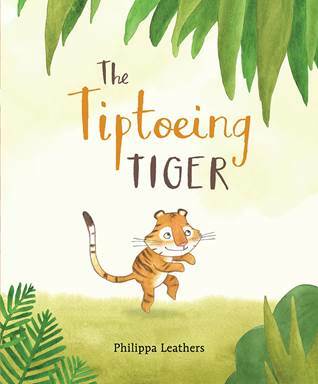 Determined to prove that he is terrifying, Little Tiger sets out on tiptoe, creeping through the forest to find someone to scare. He gets yawned at and laughed at, but Little Tiger won’t give up. Is there any animal in the forest who will find him just as sleek, silent, and totally terrifying as the bigger tigers? About the Author: Philippa Leathers is a freelance animator and illustrator, as well as the author-illustrator of The Black Rabbit and How to Catch a Mouse. She lives in England with her husband and their family. This looks like a cute story.